I am a troll collector. I started collecting trolls in the 1970′s. Some of photos shown here are from my personal collection. I will be adding more photos of other trolls when I find them. 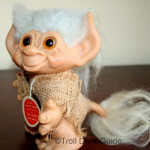 My favorite trolls are the vintage Dam trolls and the newer Norfin trolls. My absolute favorite is the 7 inch Dam tailed troll that I purchased for $1 in the 1970′s. You can see the photo on the Dam Trolls page.